Lucky to be an Air Force brat and born in Hawaii with a middle name to prove it, Meaghan Gonzalez was raised in St. Petersburg, Florida. 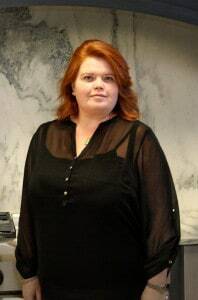 She’s always had a passion for design and has been in the kitchen remodeling industry since 2004. She joined McCabinet in 2012, delighted to find that McCabinet shares the same family focus approach that she values. As a designer, Meaghan is able to put her likes and dislikes aside and designs to the client’s taste. She loves to create one of-a-kind spaces, things that you haven’t seen anywhere else, and takes great pride in providing the client ownership just like a piece of art. Meaghan was promoted to part of the McCabinet management team in 2018 and focuses mainly on the service side of the projects. Meaghan spends her free time cooking, cheering on the Tampa Bay Lightning (she is kind of obsessed), camping, and hanging out with her husband and three sons. She is also very passionate about the military and volunteers for Dogs on Deployment.